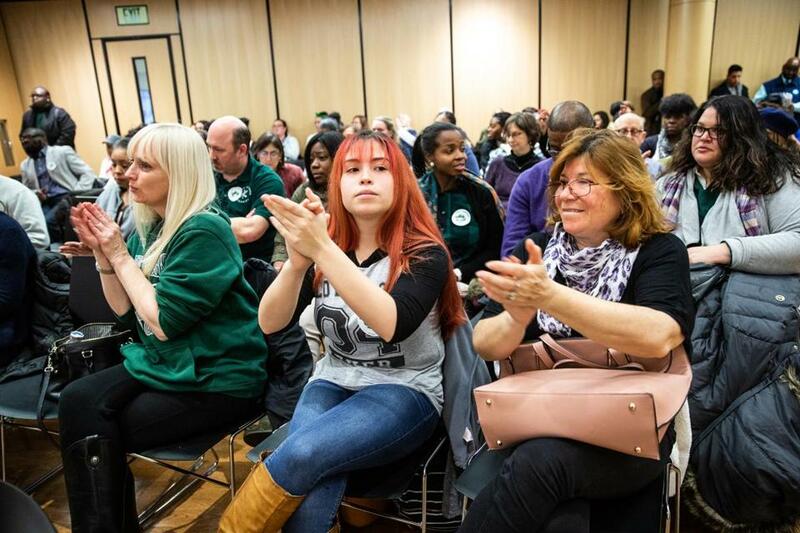 From left to right: Urban Science Academy teacher Amy Eisenschmidt, West Roxbury Academy junior Catari Giglio 16, and her mother Ingrid Morales applauded for no school closures during a Boston School Committee meeting held at the Bruce C. Bolling Municipal Building in Roxbury. Sadness and outrage filled the Boston School Committee’s chambers Wednesday evening when the board voted to close West Roxbury Acadamy and Urban Science Academy over the next two years. Committee members voted 5-0, with member Regina Robinson abstaining, in favor of the proposal shutting down the two high schools, which share a campus serving a total 680 students. Members cited poor building conditions from years of deferred maintence. The campus is now scheduled to close in June. The two high schools will stay open for another year and share space with Irving Middle School in Roslindale, but they will only educate rising seniors. Other students will have to transfer schools. “Although it’s not what I really want, it’s the only choice I have,” she said. “This situation is not ideal,” she said. Some during the meeting argued the closures will displace and traumatize students, especially those on the autism spectrum, as Urban Science Academy has a program for students with special needs. “As I have always taught my kids, actions have consequences, and your vote here tonight ... may one day come back to haunt you,” Kincade said to the committee. City councilors Matt O’Malley and Annissa Essaibi George shared their opposition to the plan as well. O’Malley urged the committee to postpone the vote, and George said members should better include parents and students in the planning process. “We need to be actively listening to what they say,” she said. Others shared frustration over an alleged lack of communication from the district. Carol King, whose 15-year-old son goes to West Roxbury Academy, said she does not think the plan is feasible for students living and commuting to school from Hyde Park, West Roxbury, and Roslindale. “They don’t have an actual high school now,” she said. School committee student representative Evelyn Reyes, a junior at the John D. O’Bryant School of Math and Science, urged members to think deeply about the trauma students at both schools are facing. “They’ve been betrayed by the district,” she said.